Silouette Cameo on left and Cricut “Expression” on right. In rear is an example of vinyl wall words. Your Cricut, Craft ROBO, or Silhouette Cameo vinyl cutter can be used for more than cutting paper for scrap-booking. There’s a whole world of adhesive backed materials you can use to create wall graphics, personal decals, custom apparel, stencils and more. We have dozens of items for scrapbook and hobby users including narrow rolls and sheets of vinyl, transfer tape, heat transfer T-Shirt Vinyl and more. What can you do with these nifty things and how do they work? Any adhesive backed media can be used with cutting devices like the Cricut, Cricut Expression, Craft ROBO, Silhouette, Cameo, or Wishblade. These come in three basic categories: self adhesive vinyls, stencil, and CAD heat transfer film (also commonly known as “T-shirt vinyl”). All have a top layer made from soft, flexible PVC or Polyurethane film, an adhesive layer, and a release liner. The presence of the release liner means you can use these in your craft cutter without the use of the carrier sheet if you wish. Some models work better with the carrier sheet under the vinyl to keep it secure while cutting. Experiment with yours to see which works best. To make it easier for our craft and hobby customers, we’ve created hobby vinyl kits and sheets made from ORACAL 631 matte vinyl, and our EnduraPATTERNS printed zebra and camo vinyls. The sheets are cut to 12” x 24” or 12″ x 25″ which makes them perfect for the Silhouette Cameo, Cameo 3, or Cricut Expression. The Zebra, Camo and Pink Zebra EnduraPATTERNS vinyls come in single 12″ x 25″ sheets. Each ORACAL hobby vinyl pack includes two 12” x 24” sheets of vinyl, two sheets of application tape on release paper, and a nifty double edged squeegee. The total price for the kit is only $9.99. If you don’t need the kit, you can get individual 12” x 24” sheets of 631 vinyl for only $1.99 each. The advantage of the sheets and kits is variety. You can get lots of different colors to use without buying more than you need for any particular project. If you value quantity over variety, you can purchase your vinyls in ten, fifty, or fifty-four yard rolls and get your transfer tape in 100 yard rolls. If you prefer rolls, we have some more options for you; EnduraGLOSS and EnduraMATTE intermediate vinyls. EnduraGLOSS is one of our best-selling vinyls for commercial sign-making. It’s easy to use, last a long time outdoors, and is now available in hobby-friendly 12″ x 10 yard rolls. As its name implies, it has a high gloss finish. It also has a permanent adhesive, so it’s not ideal for interior wall decor, but is a good choice for permanent decals, novelty stickers, and yard signs. EnduraMATTE is the indoor option. It’s made from the same high quality face film but has a matte finish and a removable adhesive engineered specifically for wall graphics on challenging, dimpled and textured surfaces. Speaking of wall graphics, one of the most frequently asked questions we hear is about what kind of application or transfer tape to use. For use on ORACAL 631, MACtac 8900 or EnduraMATTE vinyls, we recommend medium tack tape. If you prefer clear tape, we suggest Main Preview Plus GXF100 or R-TApe AT60 Clear Choice. For paper tape, the best option is Main PerfectTear Plus GXP750. For more about why we recommend medium tack tape for wall graphics, you’re invited to view our blog article. The possible uses for these adhesive backed films are unlimited. Let’s look at a few popular ideas based on the different types of materials listed above. Vinyl: Vinyl can be used for personal and commercial projects, both indoors and outdoors. 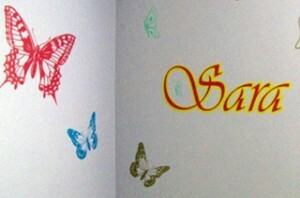 The most popular is of course “wall words” which are interior décor graphics made from vinyl. These generally require matte finish vinyl with a removable, low tack adhesive. The matte finish makes the applied image easier to read, just as using non-glare glass on a framed painting or document makes it easier to enjoy. The removable adhesive allows you to leave the graphic in place, even on painted walls, and remove it up to two years later without damaging the paint. But vinyl isn’t just for wall decals. It’s also ideal for seasonal window stickers, bedroom doors, etc. It works best on smooth, flat surfaces or simple curves. (surfaces that curve in only one direction). In addition to indoor matte vinyl, you can use glossy vinyl with permanent adhesive like ORACAL 651 or EnduraGLOSS for decorating recreational vehicles, personal watercraft, notebooks, and more. These decals should be considered permanent. They can be removed, but will leave adhesive residue behind and may damage interior painted walls when removed. They’re especially well suited for application on glass, metal and vehicles. Stencils: Stencils are familiar to crafty folks. Instead of using pre-cut paper stencils or cutting them by hand, you can buy adhesive backed stencil material and cut them with your craft cutter. These can then be applied as stencil masks for hand or spray painted items. They are also commonly used as glass etching stencils. The low tack adhesives on these films are designed for temporary use so they’re ideal for this application. They’re made in 15” and wider rolls and may need to be cut to sheets before feeding through your craft cutter. They’re designed for single use. But, if you save the liner and don’t get the adhesive contaminated with paint or etching acid, you may be able to reuse them. 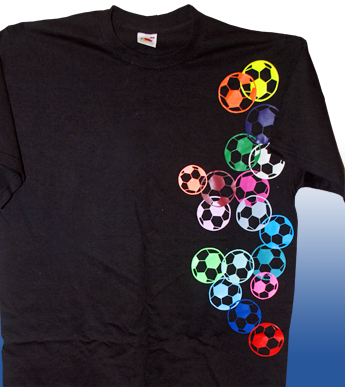 T-Shirt Graphics: Decorating apparel is one of the most enjoyable and popular uses for vinyl cutters. But since vinyl is designed to be adhered to flat, stable surfaces, it doesn’t work well on fabric. For fabric decoration, you’ll need a cuttable thermal transfer film like our EnduraTex Iron On. Iron On, as the name implies, is applied using a standard household iron. It works on cotton, polyester, and cotton/poly blends and can be used for custom personal apparel, team jerseys, club apparel, commemorative shirts for theater cast members, summer camps, etc. 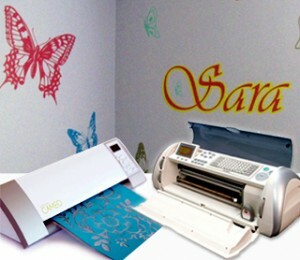 You can also use our EnduraTex Style patterned films, Chemica QuickFlex and Fashion films with a household iron. Vinyl and Stencil: The process for using vinyl in a Cricut or other craft cutter is pretty simple. Just place the sheet of vinyl in the unit and make sure the pinch rollers are near the edges of the sheet. If you have a sheet that’s too narrow for your cutter, you can place it on a carrier sheet instead. The cutter should be set to “kiss cut” which means that the blade cuts only through the vinyl and adhesive, not the backing paper. Cutting through the backing paper will make it difficult to weed the image. Weeding is the process of removing the vinyl you don’t want to apply (generally the spaces inside and around letters). Craft ROBO, Silhouette, and Wishblade users should use the yellow or red blade cap. Cricut Expression users are advised to adjust your blade speed and depth to 3 and cutting pressure to 2. T-Shirt Graphics: The main thing to remember when designing a T-shirt graphic is that you have to mirror the image before you cut it. Otherwise, text will be backwards and unreadable on the shirt. Iron On is just a little thicker than standard vinyls, so start with the same settings you would use for ORACAL 631 and adjust pressure upward until you achieve the desired “kiss cut” effect. Creating a custom apparel transfer requires the aforementioned IRON ON film and a sheet of parchment paper to protect the liner from the heat of the iron. The process takes about a minute and a half and produces a permanent transfer that’s wash and wearable. Click here for a simple, step by step guide to applying Iron On shirt decals. Depending on your cutter, it may take a little finesse to adjust to cutting vinyl instead of paper. But the fun and creative things you can do with it are well worth the effort. Wall words, personal decals, etched glass, and custom apparel are just a few of the exciting things you can create with a sheet of vinyl and a craft cutter. For Wall Words, What Are the Differences Between ORACAL 631 and MACtac 8900?